During World War II Australia and the United States often worked together. Remember that the United States entered World War II after Japan bombed Pearl Harbor in Hawaii on December 7, 1941. The US declared war on Japan. In 1942 the US had ships docking in Fremantle, Australia which is southwest, near Perth. A refueling port further north was needed for the submarines. 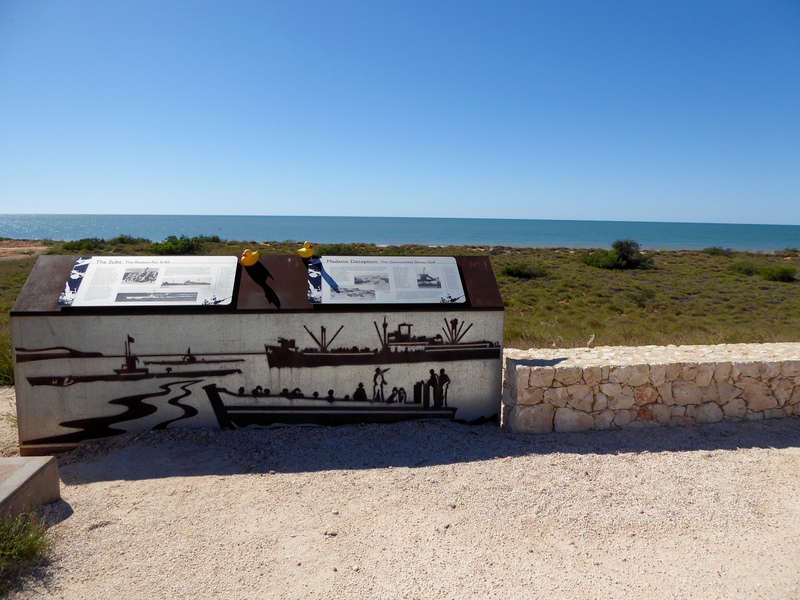 The US and Australia each built bases near Exmouth. The US stayed here from 1942-1944. The two countries worked very close in this area. 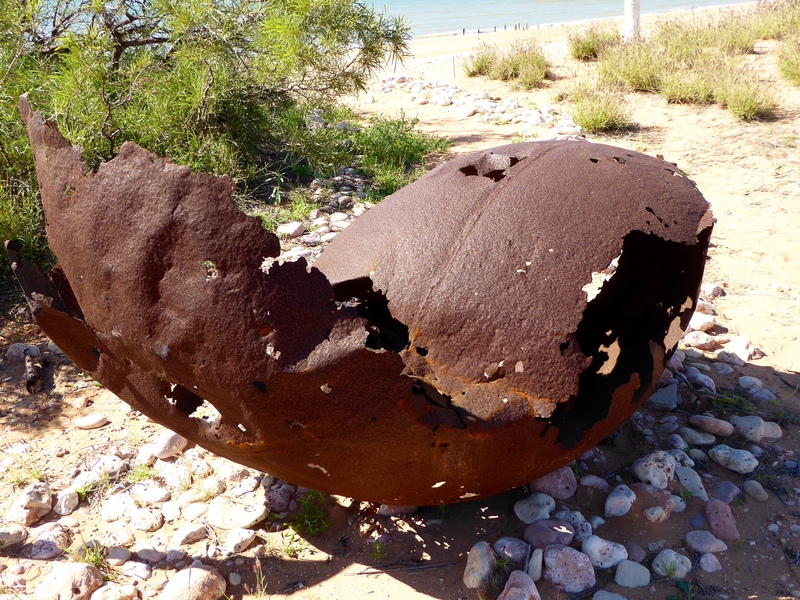 These balls of Steel, or ball float, were anchored in the nearby Gulf and used as a mooring point by boats or barges involved in Operation Potshot. 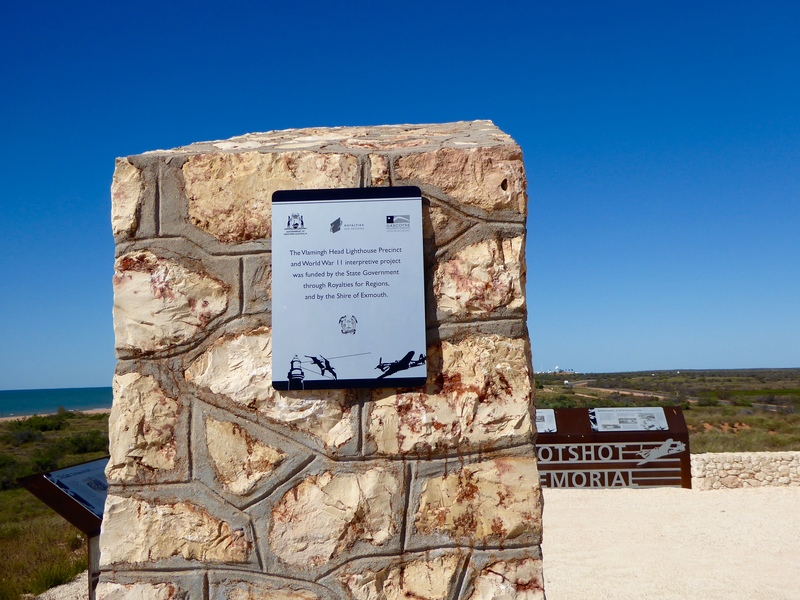 Zeb and Eider visited the site of the former US basis, called Operation Potshot. At this monument, there are several signs explaining the differences and similarities of conditions for the soldiers from each country. We think you would find these signs interesting. During this time the Japanese military was very aggressive in southeast Asia. Japan had moved through Thailand, into Malaysia and Singapore. Singapore is very close to northern Australia. 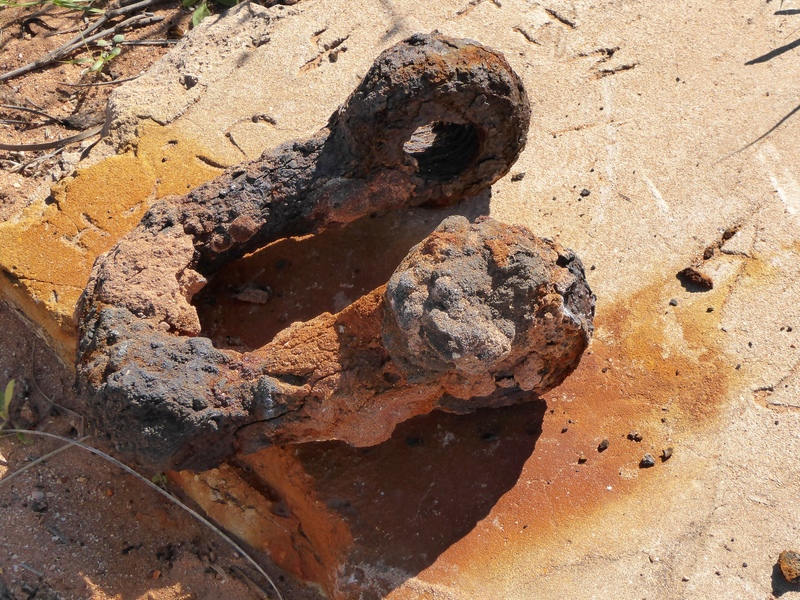 During World War II Japan bombed northern Australia very heavily. 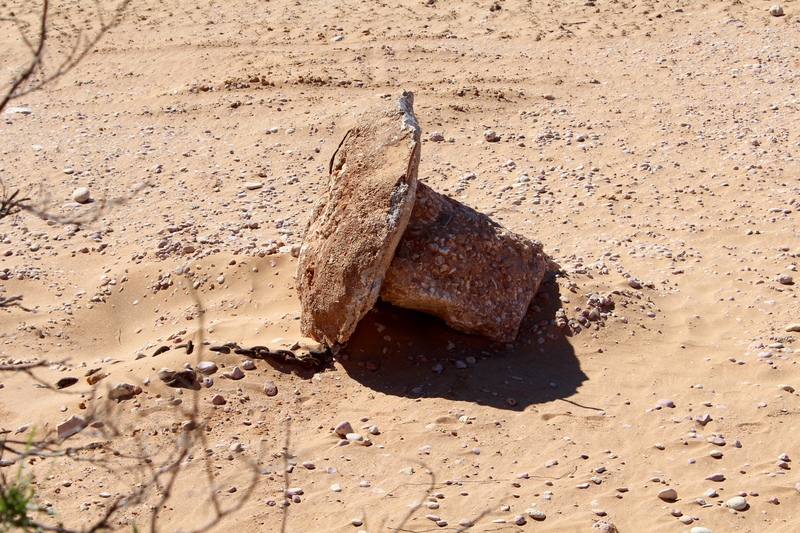 Broome and Darwin were frequent targets. Operation Jaywalk, a joint effort of 14 men from Australia and Britain, left Exmouth from the US base, September 2, 1943. 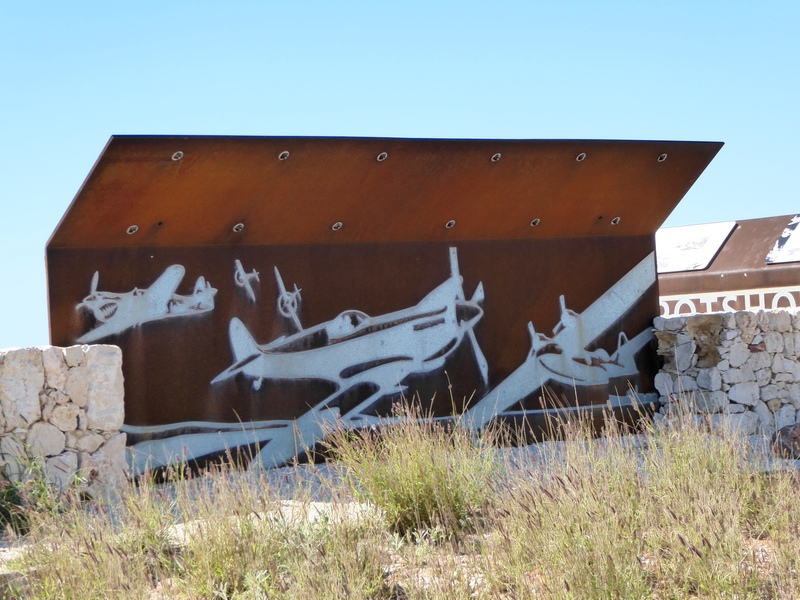 Tank floats were steel pontoons hitched together to form floating docks. These men conducted a raid on the Japanese ships in Singapore. As result, 7 Japanese ships sank or were seriously damaged. All 14 men returned to the US Base at Exmouth October 19, 1943. 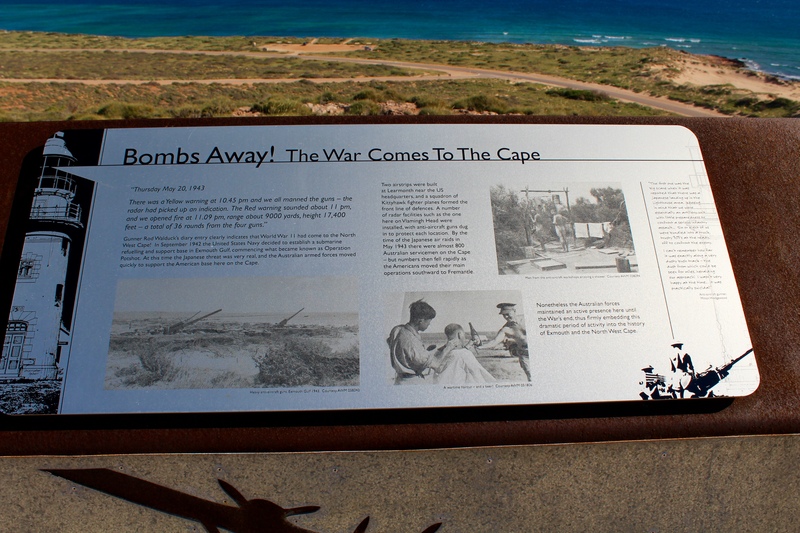 The US base was heavily damaged during the Cyclone of February 3, 1945. We, the Colorado Traveling are not history experts, but we are happy to see that both countries were able to work together to help end World War II. These monuments are very interesting and informative. 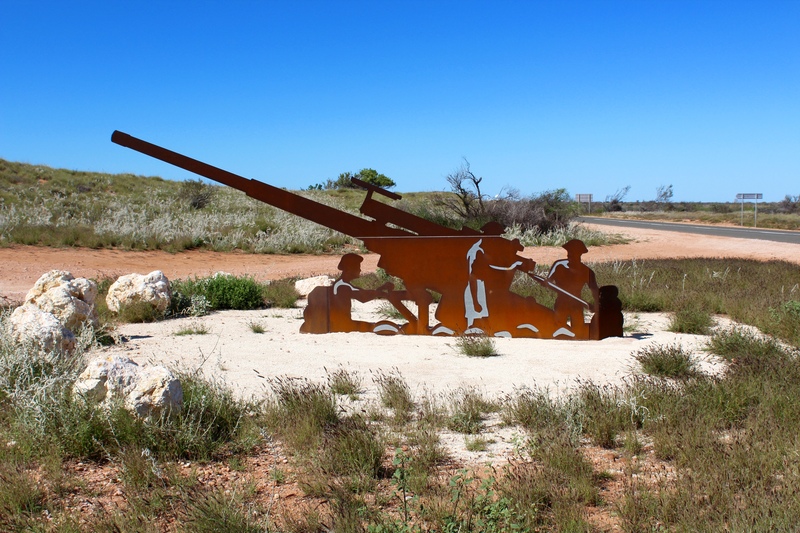 We think they would be worth some of your time when you are in the area of Exmouth, Western Australia. 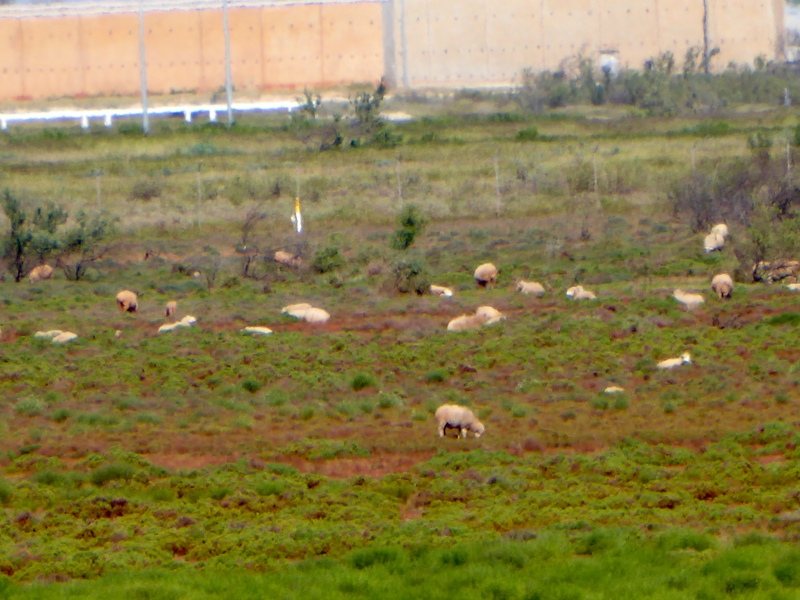 Standing by the monuments, the Indian Ocean in on one side and sheep grazing in a pasture are on the other side. 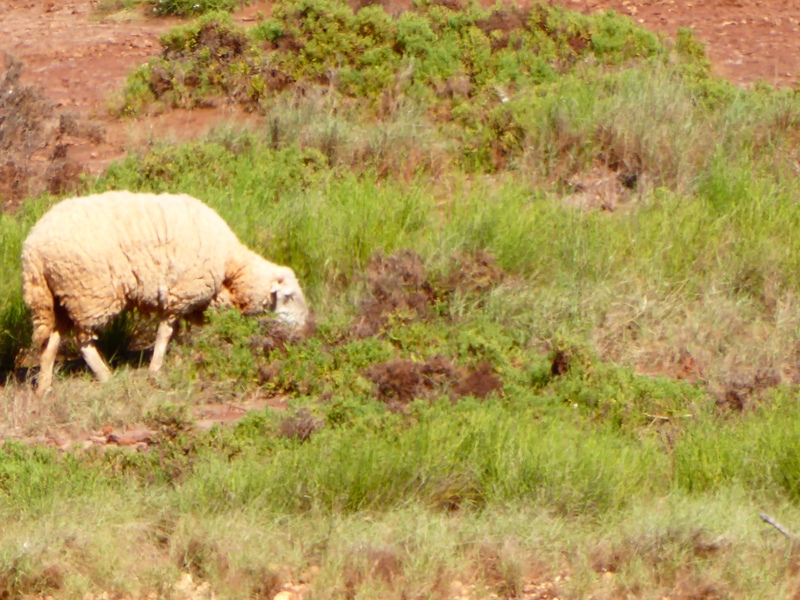 We like seeing all the sheep. More peaceful now than during the war. 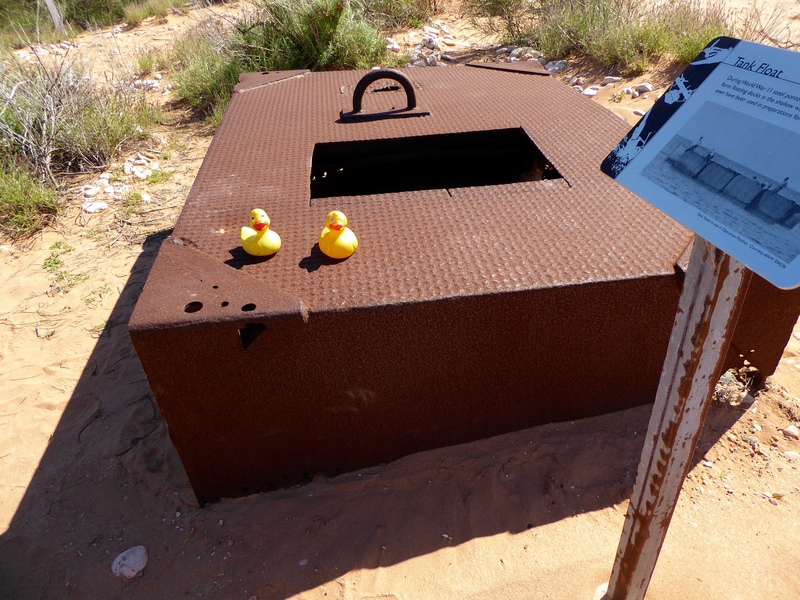 This entry was posted in Australia, Uncategorized, Western Australia and tagged Colorado Traveling Ducks, Exmouth, Japanese bombings, Operation Jaywick, Operation Potshot, US and Australia military cooperation, Western Australia. Bookmark the permalink. My father was with the allied submarine fleet during World War II, aboard the USS Hammerhead SS-34, based in Fremantle. He spoke of a place en route from Fremantle and through the Lombok Strait to the South China Sea where the sub sometimes stopped at a beautiful beach the crew could relax and swim. When in his 90s, he seemed to recall the name of the place as Exeter, but I am thinking it could have been Exmouth. 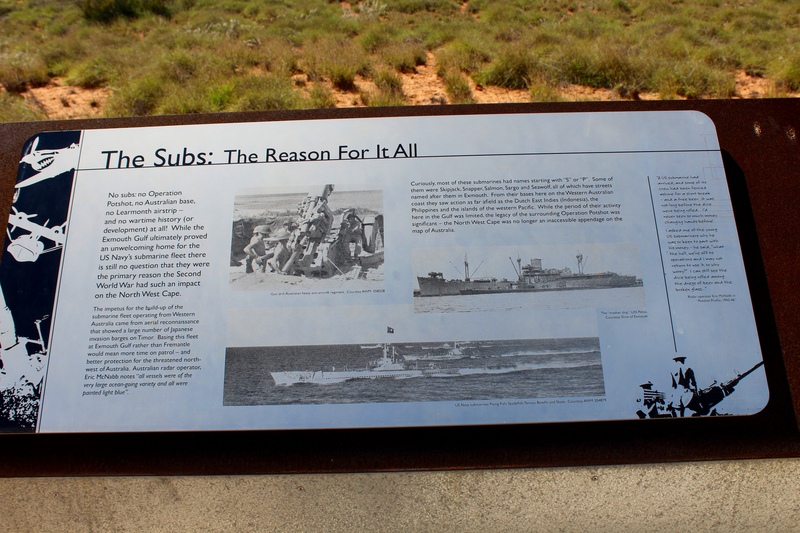 I know there was a base there early in the war that was considered as a replacement for Darwin, but then Fremantle was chosen for the submarine fleet. Maybe there was still enough infrastructure there in 1944-1945 when my Dad was on board the Hammerhead to make it a stop for a little R&R while submarine was heading to or from their war patrols. Does anyone know about that?